One of my favorite film blogs to read is Observations on Film Art, written by David Bordwell and Kristin Thompson, both of the University of Wisconsin. What I find refreshing about it is its interest in both low-brow and high-brow cinema, blockbusters and art house films, and I like Bordwell’s interest in exploring the connections between film and other forms of artistic expression, especially literature. He recently wrote about the structure of narrative in film and its corollary in fiction in the entry, Watching a movie, page by page. 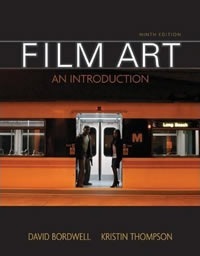 I am using their book, Film Art: An Introduction, in a course I am teaching this fall at Asbury University, Film as Literature.